This week, Erlang Solutions announceed their upcoming webinar, Building a Global Multiparty Video Chat Platform for Developers, in partnership with Vidyo. 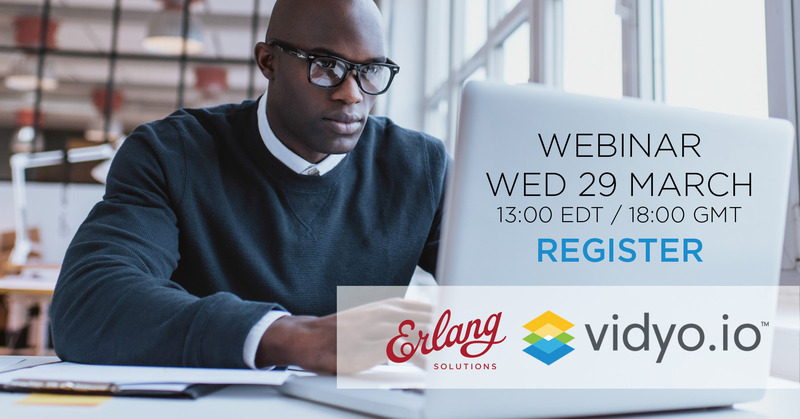 Join Erlang Solutions and guest speaker Nicholas Reid who will draw on his experience as Senior Vice President of Product Management at Vidyo to discuss the process of building a multiparty, cloud-based developer platform. Can’t attend live? You should still register! We’ll send out the slides and recording after the webinar for you to catch up on. Vidyo.io is a Video Communication Platform as a Service (CPaaS) that provides high quality video chat APIs. Using Vidyo.io, developers can easily embed multiparty video into their own mobile, web, or desktop app quickly and easily with no video knowledge required. Building a global cloud service that provides reliable video chat can be very challenging.